We bow down, bow down, to Lisa Simpson, yes, Bart’s sister, Homer’s daughter. The summer after 4th grade, 9-year-old Alexx Hinkle was watching “The Simpsons” when Lisa started playing saxophone. He sat up. Eureka! Alexx wanted to play too. When choosing something at the music store, it could have been saxophone…it could have been French horn (“I really like the French horn,” Alexx says.) But, something drew his hand to the violin, and that’s what went home with him. “We had a very good music program in elementary school,” he says. That was in Alton, Illinois, actually a suburb of St. Louis, on the Illinois side of the Mississippi. But most kids had started their instrument the year before, so he just played along by ear and tried to catch up in the group lessons. Quarter notes, time and key signatures, well, they remained a mystery. “I could sort of read music, but I had to put finger marks on everything, so I played by finger rather than by notes.” Alexx continued that way—no private lessons, pretty much self-teaching—through 8th grade, when his “enlightenment” began, as he says. Three months later, he was playing Kreutzer. He moved to 2nd chair, seconds. Six months after that, Bach Sonatas and Partitas. Followed quickly by the Mendelsohn violin concerto. Whaaat?! From Susuki 3 to the Mendelsohn in less than a year? “It was a musical rush,” Alexx admits. Then, third stand, firsts. He went to state competitions and won playing the Sibelius violin concerto. Oh, and he learned viola as well. Alexx went to the Peabody Conservatory, gaining admittance playing the Walton concerto—for viola! But it was all perhaps a little too fast. He’d only had lessons for four years. He didn’t feel prepared for how hard you’re pushed, didn’t click with his teacher, and was feeling constrained by the strictness of interpretations and the viola repertoire. He left in January of his freshman year. He landed at the University of Missouri in St. Louis as a double major, pre-med and music. 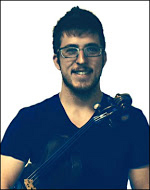 “I found a really wonderful violin teacher and settled in.” By his sophomore year it had become clear that he really did need to make a choice about which way to go, and he choose the sensible career path: pre-med. The next year demanded a lot of math and science and soul searching: “I was afraid I couldn’t make a living as a musician; being a doctor is much more secure.” Yet, he was still playing violin every day and listening to the forlorn melodies of the Walton violin concerto (not viola) over and over and over. In the end, music won. “I always hoped I could provide something for others that they couldn’t do themselves,” he explains. “When you go to a great concert, it leaves an impact on you. I wanted to do offer that.” Alexx went to the San Francisco Conservatory of Music and got a degree in violin performance in 2010. He’s now assistant concert master at the San Francisco Sinfonietta Chamber Orchestra, a coach for the firsts and violas for the Sunset Youth Orchestra, subs in the Santa Cruz Symphony, gives private lessons and plays weddings, dinners and whatever gig you might have in mind. Alex is also a member of the Magik*Magik Orchestra, a totally brilliant idea: a made-to-order group of professional musicians (from a soloist to a full orchestra) available for other musicians, artists and creatives. With them, Alexx has played with music legends such as Sting, Chris Botti, Bob Weir, The Fifth Dimension and John Vanderslice, as well as performing Johnny Greenwood’s Popcorn Superhet Receiver. “I like practical, real world experiences,” he says, which is why he’s playing with Prometheus. “I’m learning repertoire in context rather than just playing on my own. For example, I’ve never played the entire Schumann. I’ve played the scary Scherzo (second movement) and yes, it’s very, very fast and chromatic. It’s really hard. But if you think about the musicality and how he’s using it as a creative expression amidst all the other sounds he’s developing, that helps me not get freaked out about it” (well, some of us remained just a little freaked while playing it). What’s next? “I’m still thinking a lot about the Walton violin concerto,” he says. “It was dedicated to and first played by Jascha Heifetz, but it’s rarely performed today. It’s huge, driving energy, then intensely delicate. It has so many innovations in harmony, phrasing and tone colors. And those forlorn melodies. The violin really lends itself to that. It would be such a great opportunity to bring this to the ears of more listeners.” Alexx finally believes he can offer music to the world. We’re very happy he’s offering it as concertmaster of Prometheus Symphony. And thank you, Lisa Simpson!